I encountered this curious female polar bear during my June 2015 Svalbard expedition. This image was featured on the first page of my article about Arctic wildlife in the January 2016 issue of Popular Photography. During this once-in-a-lifetime encounter, I leaned over the sailboat’s railing and lowered my polecam down to her level on the ice. She repeatedly checked it at point-blank range which allowed me to photograph this incredibly close-up and intimate portrait. I’ve been behind on my photo editing, blog posting, and social media-ing, so hopefully in the next few weeks I will get back on top of it. 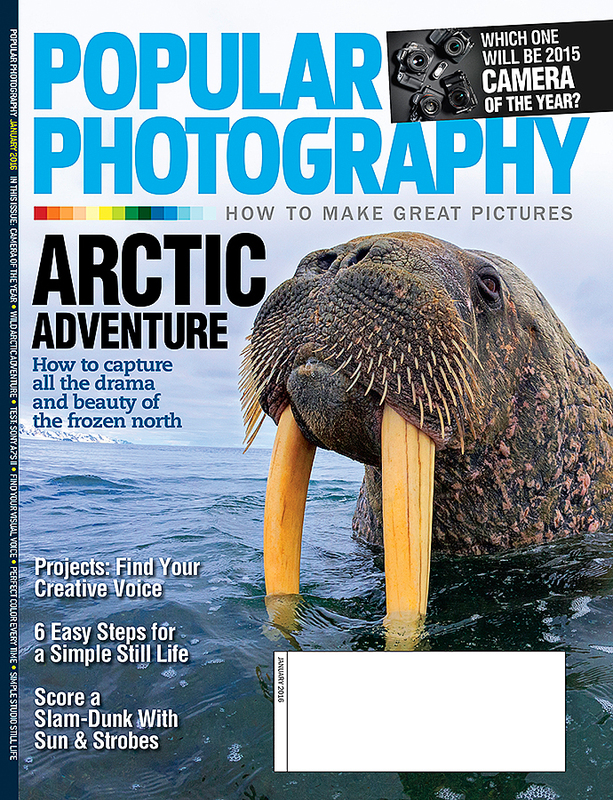 To start it off, I want to share my walrus image that graced the January 2016 cover of Popular Photography. I photographed this behemoth last June while co-leading a small sailboat expedition around Norway’s Svalbard Archipelago with Tony Wu. I cautiously waded into the shallow water with my polecam outstretched and quickly shot some images before he let me know that my presence was unwelcome.